What is the goal of your current project? I currently work on a project for the transmission system operator for the Norwegian electrical grid. The value of the system we’re building is that my beer stays cool. If you’re not skilled at what you’re doing, you may put in a lot of hours and end up having nothing to show for it. Maybe you ended up writing code that didn’t compile and you had to throw it away. Maybe you ended up staring at an empty screen for hours waiting for inspiration to strike. Maybe you ended up writing a long document, only to forget to save it and then your computer crashed. The first trick to making sure that your work is worthwhile is to make sure that the effort you put in actually transforms to some effect. In order to achieve this, you need experience and practice with your craft. If you don’t know why you’re doing what you’re doing, you may produce a lot, but it ends up not being valuable to anyone. Maybe the code you write solved the wrong problem. Maybe your long document didn’t answer the questions of you readers. The second trick to making sure that your work is worthwhile is to make sure that the effect you have actually produces value. In order to achieve this, you need to move in the right direction. This is the model of all human industry, whether you’re making cars, books, food, presentations or software. In software development, effort is the time you put in, skill is your skill as a developer, effect is the working software, purpose is the architecture and value is the business goal. The fast track to success is to understand the last step: Value. 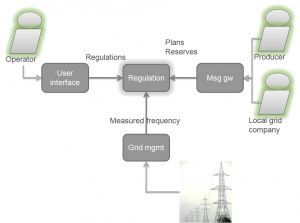 My current project creates a system which presents in user interface electricity reserves and planned electricity production that it has received from a message gateway, as well as measurements that it has received from an electricity management system. This is gobbledygook. If this is how I see the system, I will fail. In order to see the value, we have to take a step back. 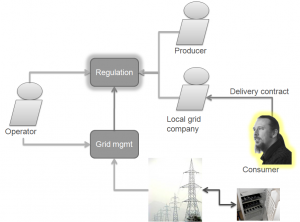 The system receives planned production and available reserve capacity from power producers. 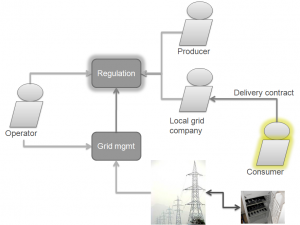 It presents this, along with measurements of the current balance between consumption and production on the electricity grid to an operator. The operator uses the reserves to regulate production to match consumption. Hopefully, this is much more understandable. You’re probably aware that there are companies that produce electrical power, and you probably understand that electricity consumption should match production. 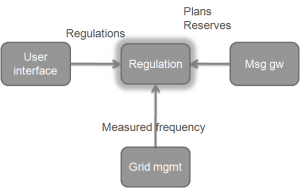 The ultimate value of the system is to the consumer who want to plug his appliances into the grid and have them work. They should neither blow up (too much production) or lose power (too little production). Who is this mysterious “consumer”, then. Why, it’s me! It’s not Johannes-the-software-developer, it’s the other me. The “me” who has his fridge connected to the power grid so I can keep my beer cool. The purpose of my project is to keep my beer cool. To understand the purpose of your system, you should try and see how it contributes to your own life. Not the life of the “you” who develops software, but the “you” who uses electricity, the “you” who drives a car, the “you” who breathes fresh air, the “you” who wants to retire at some point in the future. If you can’t see “the other you” in your system – take a step back and look again. If you still can’t see “the other you”, maybe you should be working on a different project. Now, if you can only give me a knob that regulates the power so my fridge also works for wine?